© 2018 Songahir Christophe et al. We report an exceptional clinical case of an ipsilateral dislocation fracture of the shoulder and right elbow, realizing a “swinging arm”. Following a violent road accident, patient S.I, a 43-year-old left-handed sports educator, presented with an antero-medial shoulder dislocation fracture and a posterolateral ipsilateral elbow fracture-dislocation. The reduction in urgency, followed by the orthopedic compression by Mayo Clinic and functional rehabilitation, allowed obtaining a good result after seven months. The ipsilateral bipolar dislocation of the shoulder and elbow is an exceptional lesional entity. Its adequate care in emergency makes it possible to obtain good anatomical and functional results. Keywords: Fracture, Dislocation, Bipolar, Shoulder, Elbow, Swinging arm. Bipolar dislocations of the thoracic limb are rare lesions resulting from violent trauma [1-5]. It is an emergency the treatment of which consists of a reduction and stabilization of the lesions, followed by functional re-education of the traumatized limb. The authors report an exceptional clinical case of an ipsilateral dislocation fracture of the shoulder and right elbow, realizing a swinging arm. The 43-year-old sports educator, S.I. left-handed, suffered a road traffic accident on February 27, 2016. He was a passenger on a transit bus that would have rolled several times. This accident caused a staged closed trauma of the right thoracic limb. The exact mechanism of injury could not be specified. 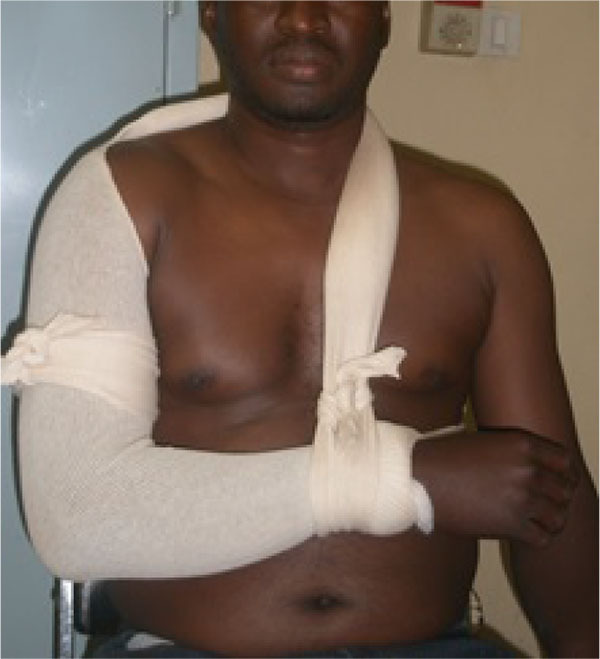 He had sharp pains in the right shoulder and right elbow, with absolute functional impotence of the right thoracic limb. He was rushed by ambulance to the teaching hospital Yalgado OUEDRAOGO, trauma department about three hours after his trauma. The physical examination returned to Desault's attitude with deformity and swelling of the right shoulder and elbow. The vasculo-nervous examination was normal. The X-rays of the shoulder and the elbow, AP and lateral views, revealed anterior medial dislocation fracture of the shoulder Fig. (1) and a posterolateral dislocation fracture of the elbow Fig. (2). 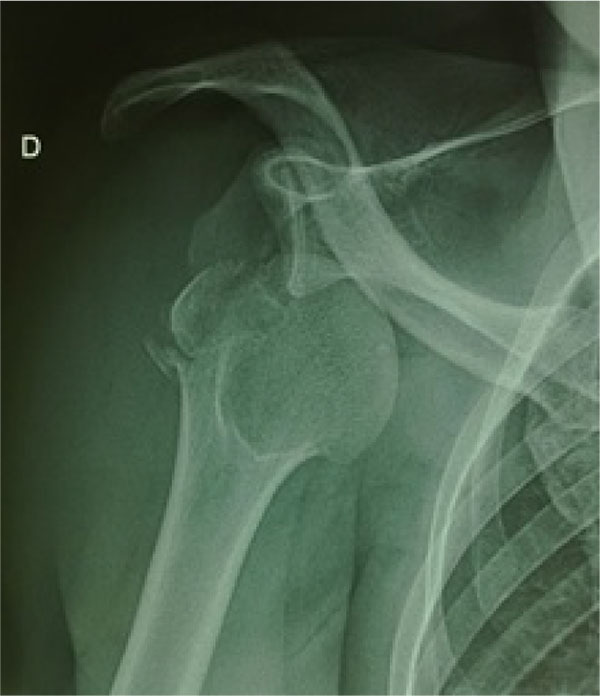 The anteromedial fracture-dislocation of the right shoulder involved a right glenohumeral anteromedial dislocation and a fracture of the right major tubercle. 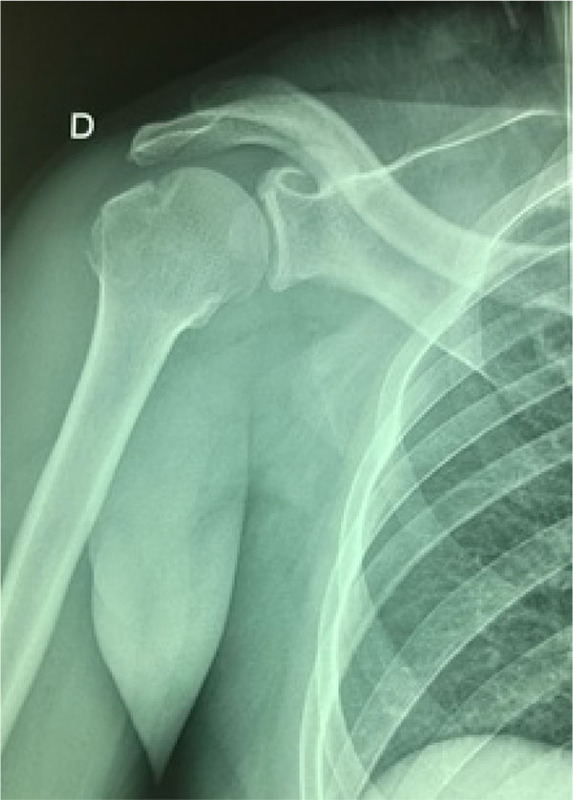 The posterolateral dislocation fracture of the elbow consisted of a posterolateral elbow dislocation and a complex fracture of the right coronoid process. Treatment consisted of emergency orthopedic reduction, under general anesthesia, of the shoulder and elbow injuries, followed by immobilization elbow to the body by Mayo-Clinic Fig. (3). Fig. (2). Posterolateral fracture dislocation of the right elbow. Fig. (3). Immobilizing by Mayo-Clinic. Radiographic control images showed satisfactory reductions in both the shoulder Fig. (4) and the elbow Fig. (5), with a non-anatomical reduction of the coronoid process fracture. The immobilization was maintained for six weeks and then the patient received 25 functional rehabilitation sessions of the right shoulder and elbow. Fig. (4). Post-reductional AP X-ray control of the fracture-dislocation of the shoulder. Fig. (5). 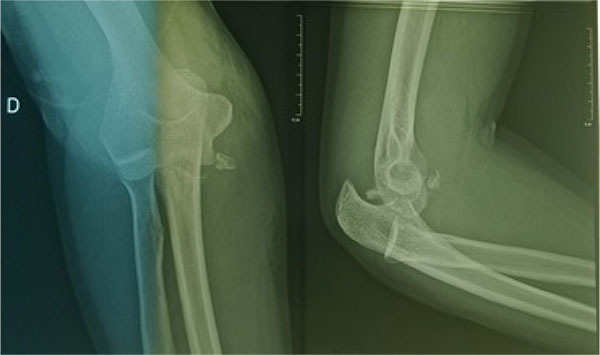 Post-reductional X-ray of the elbow fracture-luxation. 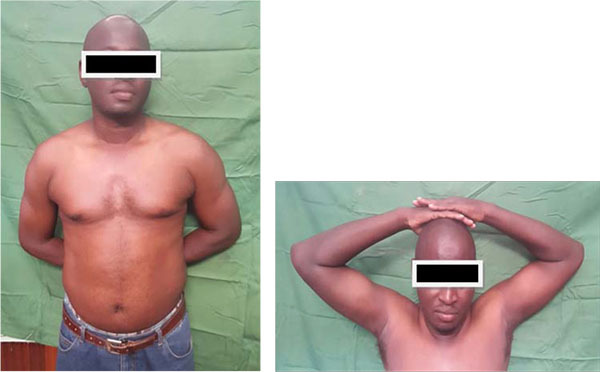 At seven months' follow-up, the shoulder was painless with normal mobility Fig. (6). At the elbow, the patient reported moderate pain during efforts. Prono-supination and flexion were almost normal, but the patient had a 7 ° elbow extension deficit Figs. (7 and 8). Fig. (6). Satisfactory functional result of the shoulder in the 7th month. Fig. (7). Very good elbow flexion at seven months follow-up. Fig. (8). Slight deficit in elbow exten-sion at seven months' follow-up. Radiographic control images at the follow-up of seven months showed a consolidation of bone lesions in both the shoulder and the elbow Fig. (9). Fig. (9). 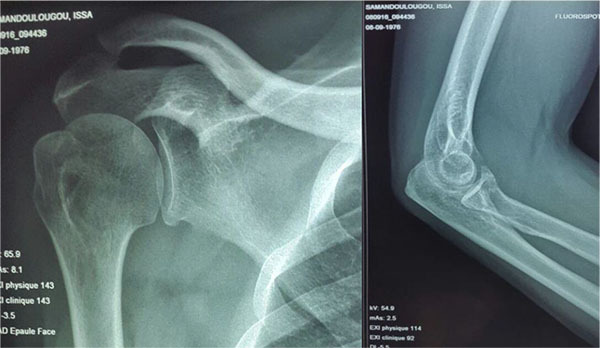 Bone consolidation of the elbow and shoulder at seven months follow-up. The bipolar dislocation fracture of the shoulder and elbow producing an ipsilateral “swinging arm” is exceptional. We have not found a similar case in the literature. The few rare cases of bipolar dislocation of the thoracic limb reported in the literature relate to the forearm (elbow and wrist) . These lesions are due to violent trauma and require emergency management, by reducing and restraining lesions [1, 2, 4, 5]. Open reintegration of the fracture of the coronoid process followed by additional compression by plaster splint, would have improved anatomical and above all functional results. The ipsilateral bipolar dislocation of the shoulder and elbow is an exceptional lesional entity whose mechanism of occurrence remains complex in the course of a violent trauma. Its emergency management makes it possible to obtain good anatomical and functional results. Ennaciri B, Kharmaz M. Bipolar dislocation of the forearm (floating forearm). Pan Afr Med J 2015; 22: 234. Daoudi A, Elibrahimi A, Loudiyi WD, Elmrini A, Chakour K, Boutayeb F. Bipolar forearm dislocation or floating forearm (a case report). Chir Main 2009; 28(1): 53-6. Dieme C, Bousso A, Sane A, et al. Bipolar dislocation of the clavicle or floating clavicle. A report of 3 cases. Chir Main 2007; 26(2): 113-6. [French]. Masmejean E, Cognet JM. 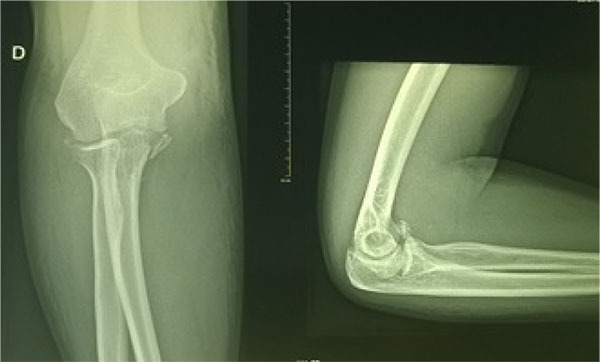 Bipolar dislocation of the forearm: elbow and perilunate dislocation. Rev Chir Orthop Repar Appar Mot 2001; 87(5): 499-502. Sy Mouhamadou Habib, Diallo Malick, Ndiaye Abdou Risah, Amadou Ndiassé Kassé, Sané Jean-Claude. Gueye Diouf Amadou & al. Traumatic floating bone: about 11 cases and review of the literature. Orthop Traumatol Surg Res Vol 99, N°7S-p.S346-nov 2013.